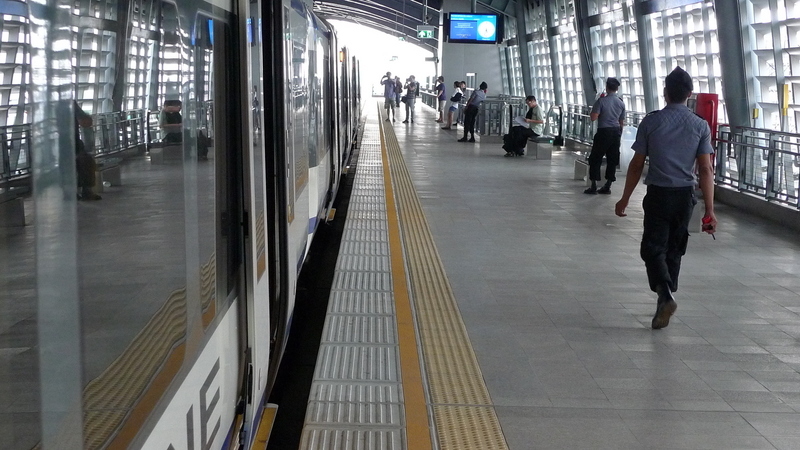 Three years late, the rail line to the Bangkok Suvarnabhumi International Airport has finally started running, although on a limited, trial basis. Last week I headed out for a look at this latest addition to Krungthep’s transit infrastructure. 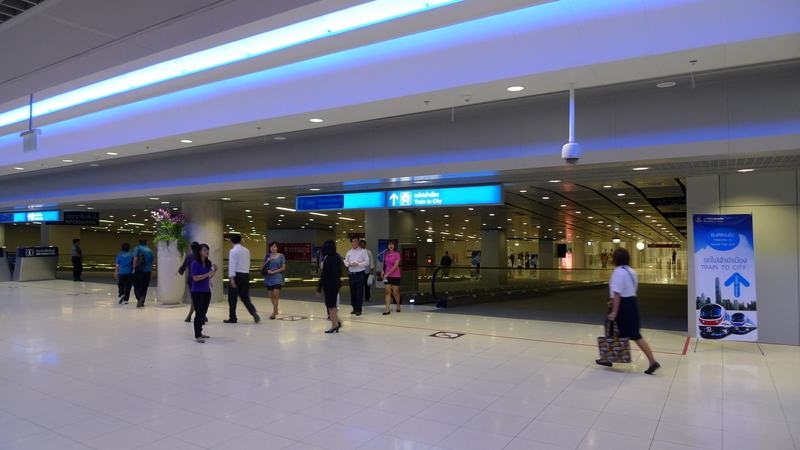 The new airport, Suvarnabhumi, opened more than three years ago about 30 km east of the heart of the city. The planned rail service, the so called “pink line,” suffered through interminable delays caused for any number of reasons, not the least of which might have to do with the State Railways of Thailand’s notorious inefficiency. The SRT, which owns the right-of-way, built, and will eventually operate the pink line, has never turned a profit in its more than half-century of operations. Nonetheless, I’m excited that another piece in the transit puzzle is nearly put into place as the line started limited trial service almost two weeks ago. The pink line is actually two lines: the darker line is the city line, which will make multiple stops between the airport and Phaya Thai, which is currently the westernmost station. As you can see in the above map, there were several planned but unbuilt stations, shown with station names in outlined font. The second, light pink line is the airport link, which will run nonstop between the airport and the Makkasan station (at Asoke and Petchaburi Roads), where the in-city terminal will be located. If all goes according to plan, passengers will be able to check in for their flights at Makkasan station, receive boarding passes and drop off their bags, then ride on the train to the airport. Their bags will be carried in a secure storage area and, already ticketed, will go from the train directly into the airport’s baggage system. It sounds like there will be some delay before that part is operational. Additionally, the plan is that passengers on the pink line will be able to connect with the BTS Skytrain at Phaya Thai and with the MRT subway at Makkasan-Petchaburi. Sadly, it appears that neither connection is currently built. I met up with Bill and Ken, two friends with an interest in things both transit and aviation related, at the Phaya Thai BTS station to give the pink line a try. 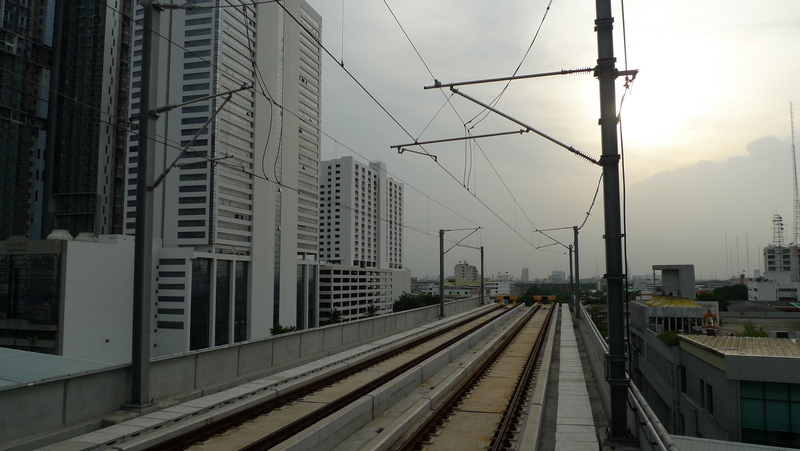 During this trial run, only the two end stations – Phaya Thai and Airport – are operational on the pink line. The train service is running weekdays from 7-10 am and 4-10 pm nonstop between these stations, although some intermediate stops will be introduced next week. This trial run is free and will last until August, when the full system is supposed to be in service. 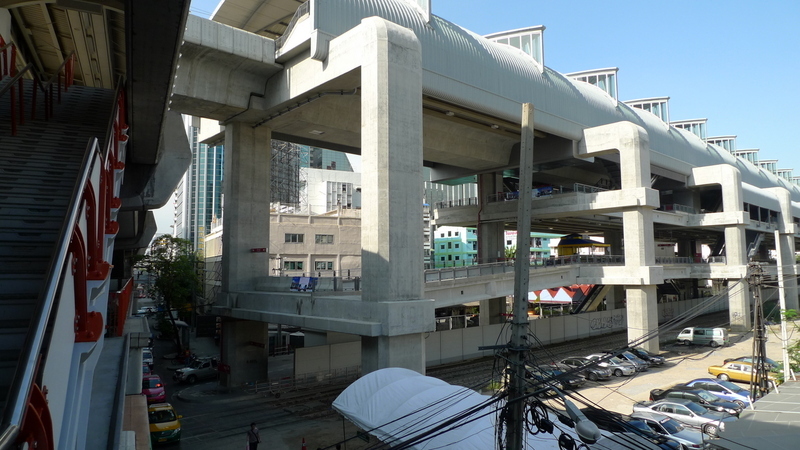 Above, you can see the Phaya Thai station of the pink line, the big concrete behemoth on the right, and a ramp that is supposed to connect to the Phaya Thai BTS station on the left. You’ll notice, though, that the ramp stops about 5 meters short of the BTS station. I’m curious about this because passengers will have to walk down to the street level, along 100-200 meters of broken, dirty sidewalk, cross an active railway line, and then ascend into the second station, regardless of which way they are connecting. Above: Flagman at the active railroad tracks that passengers connecting between the pink line and BTS have to cross, directs cars off the track as a train approaches. My theory for this is that the two systems didn’t communicate very well, even though the BTS has been running for more than ten years so certainly wasn’t an unknown entity. The ramp would connect a paid area in the BTS station with a public area in the pink line station. So someone is going to have to pay to build and maintain turnstiles and a BTS ticket booth somewhere at the connection point. This is insane because the three rail systems in town are supposed to be moving to a common ticket platform – one ticket, all systems – so the ramp should lead from the paid area to another paid area, not pass through a public area of the pink line station. Anyhow, we walked across the railroad tracks with no problems and took the elevators up several levels in the new pink line station, being directed by friendly guards the whole way. The trains (these are the city line trains being used for the test run, not the airport link trains) are from Siemens and they look nice enough. The stations along the line are not very impressive, a collage of grey concrete and grey metal. 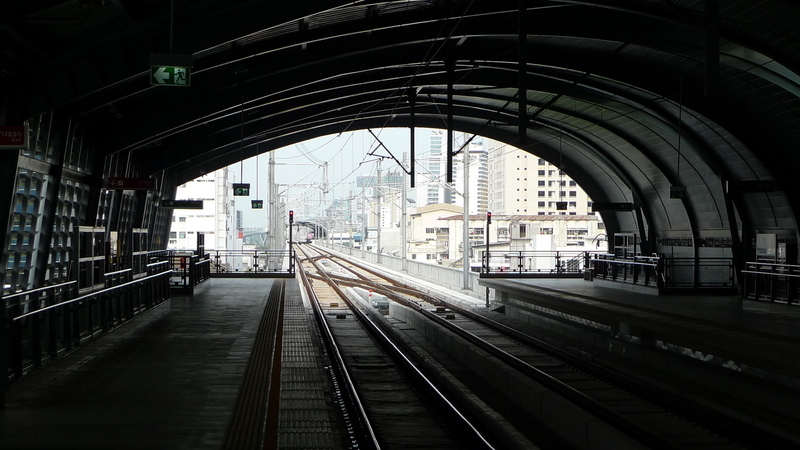 Only the Makkasan and Airport stations are air conditioned. The line was pretty well used when I took it about 4pm. By the time the train left, the seats were full with many of the passengers looking like airport employees or people who live out in the eastern suburbs. There were also many local tourists traveling just to see the new train and, surprisingly, a few people actually using the train to get to the airport with their bags. 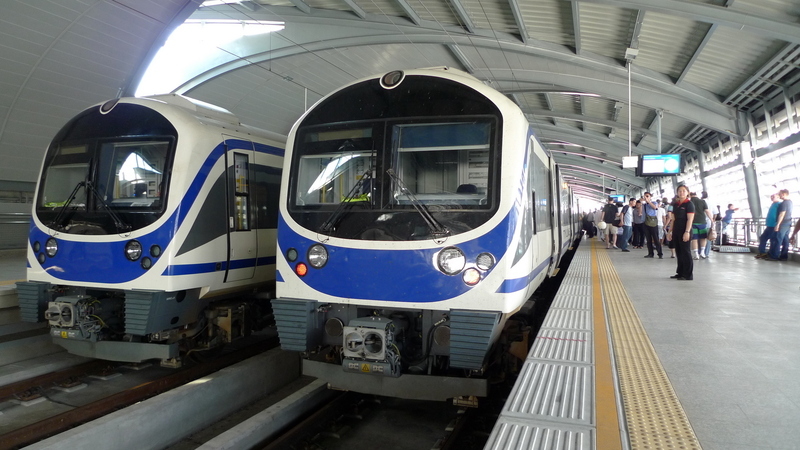 Once the line is fully operational, the city line will charge between about 10-40 baht (up to US$1.25) and the airport link will charge 150 baht (US$4.75). 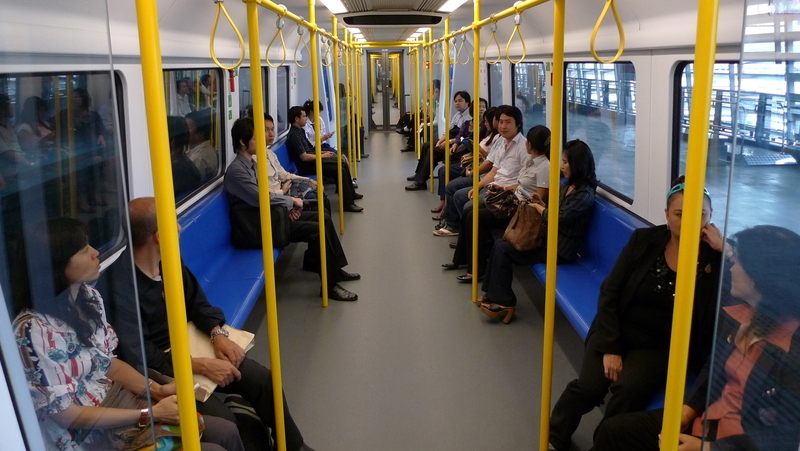 I would assume that the seating arrangement on the airport link train will feature pairs of seats facing forwards and backwards along with storage space for carry-on baggage. Notice the wide gap between the train and the platform. It looks like there is a ledge under the door that can be extended, but they were not doing that. 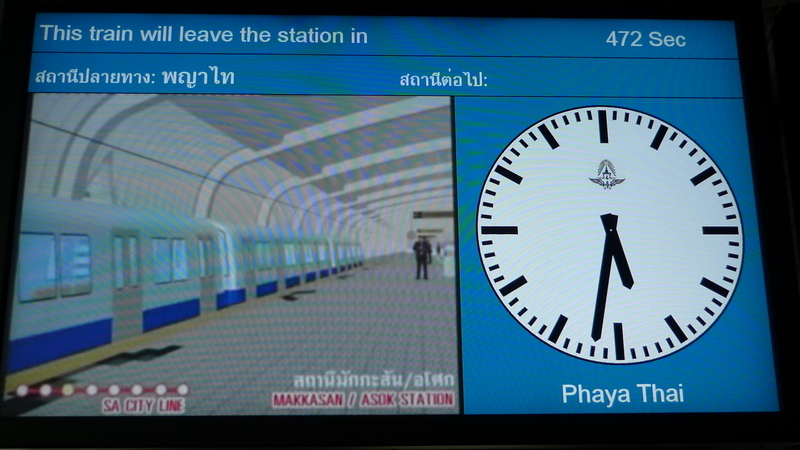 The monitors in the station show a video of the route, alternating between Thai and English. There is also a countdown clock until the next departure – shown in seconds! I’ve never seen a train station that shows countdown time in seconds. And, believe me, SRT isn’t the sort of prompt organization that runs things to the second. 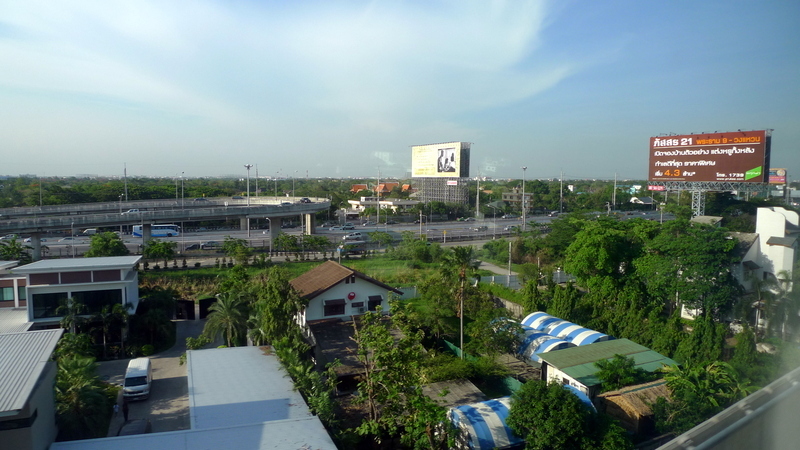 Looking east from Phaya Thai station towards the Ratchaprarop station, the two closest stations on the line. The ride itself was very smooth, with the exception of one station midway through the line where there is a passing lane. We had to slow down significantly to change tracks, breaking our otherwise good speed of approximately 120 kmh or 75 mph. We were going faster than all but the fastest taxis on the expressway that parallels the tracks most of the way to the airport. Along the way, there was a nice view of the many new housing development springing up near the airport and the new stations on the pink line. This line will probably become very useful, less for airport passengers and employees, but more for locals who live to the east of the city and need a fast way to commute into town to their offices. It took just about 20 minutes to go from Phaya Thai station to the airport. I understand that the airport link service from Makkasan to the airport will be about 16. The train pulls into the sub-basement of the car park structure, connecting directly into the terminal building. A quick ride up the elevator or moving sidewalks and you are at the arrivals and departures levels. Very convenient on this end of the line. In the future, you will be able to walk through this station to the airport hotel, which you currently have to take a shuttle van to. The station will also have various retail shops, although those are all located on the hotel side of the station, which doesn’t make much sense. There are some potential cons to the system right now and I’ll have to wait and see how it works once the whole system is up and running, then I’ll talk more about the cons if they haven’t been addressed. For the moment, I’ll simply say that I’m glad additional transit options are opening and I hope that we’ll see several more in the next few years. Speaking of which, one has to wonder where the pink line, which ends just to the west of the Phaya Thai station, will go in the future. The master plan shows this line continuing, turning north and heading towards the old Don Meuang airport (and beyond) and also turning south and heading to the current Hualamphong train station and then underground, across the river, and southwest to Samut Sakhon province. Ambitious! This entry was posted in Uncategorized and tagged Bangkok, infrastructure, Krungthep, rail, Rapid Transit, Thailand, transit, urban planning by christao408. Bookmark the permalink. Looks like it is progress – and like anything new still has a few kinks… But I do like the idea of going from the airport to the city in an express fashion. @murisopsis – Unfortunately, one of the biggest “cons” that I didn’t go into is that the in-city station – Makkasan – is located in an area that is gridlocked with traffic much of the day and is still some distance away from the major business districts. Once you’ve taken the express train into the city, you will likely have to get into a taxi and sit in traffic, effectively defeating the purpose of the express train. Would have been easier to take a taxi from the airport, which could drive on the expressway until almost at the destination, only having to get into traffic for the last short bit. very nice. we’re still struggling to get a direct link YYZ to the city here. That countdown feature looks cool. More metros should have that. I’m looking forward to my next trip to Bangkok to test them out! I like the idea of the seconds countdown! @brooklyn2028 – @AzureRecollections – @AppsScraps – So many Torontonians reading and commenting. All the more reason for me to get up there for a visit one of these days! Yes, I’ve always wondered why building a train to the airport is such a problem in TO, considering that there is a good rail network already. It isn’t like the idea of rail transit is somehow new there. @agmhkg – I understand the new line to YVR is quite nice, too. @Dezinerdreams –@Roadlesstaken – The countdown clock is a good idea and I’ve seen it in many other transit systems. But counting down the seconds? That seems like overkill. @marc11864 – Assuming that won’t be for a few years, we should have all the kinks worked out by then. =D@yang1815 – Indeed it is. @christao408 – I remember reading about a major train accident in Japan because the train was running 2 seconds late and the driver tried to make it up by increasing the speed. @Dezinerdreams – Really? Okay, that’s certainly not the case in Thailand! 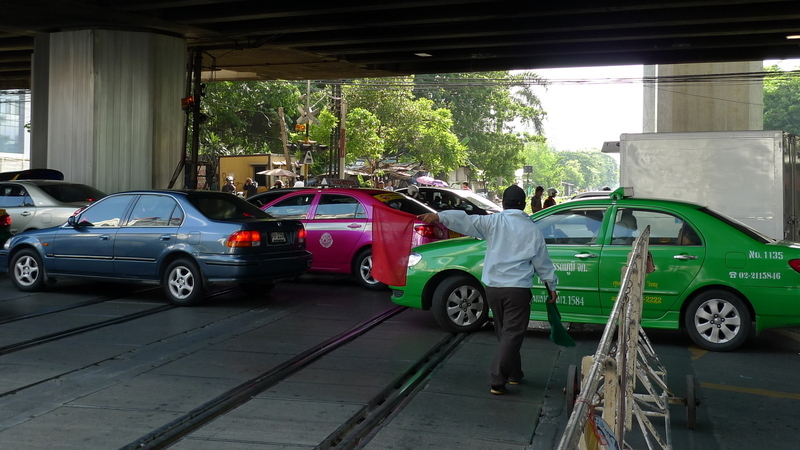 @TheCheshireGrins – Meg, in Bangkok many people own cars but many people also use transit. The kind of transit most popular is the bus system, which is extensive, poorly designed, inexpensive, and crowded. I should probably write an entry about it, but I don’t actually know that much about it. The busses, however, are packed like the Tokyo subway during rush hour.There are no restrictions on cars entering parts of the city, although the governor of Bangkok has proposed a congestion pricing scheme. As you would expect, it has encountered a lot of opposition. Unlike other cities, the government doesn’t have as much “dammit, we’re going to do this” authority. There are several areas of the city, though, where such a scheme would be excellent. Oh – this is nice. It just needs to get a few “kinks” sorted out. We don’t have anything like that yet. There’s a proposal underway but there’s lots of protest because they will be using diesel engines. Is the Don Meuang airport still operating? I just went through five days of navigating the Tokyo subway system. I think it’ll be fun to do that riding from Suvarnabhumi Airport into Bangkok. Did you say the system will reach the old Don Meuang Airport? If so, I wonder how many years that’ll take, given the efficiency of the bureaucrats. Taking the high speed train is going to be much safer than riding in those crazy taxis cabs, right? wow Chris, this is very impressive. I hope the traffic snarls will be taken care of soon so that people will get the benefit of using the metro in peace.